From January 31 to February 8, new aircraft will land in the Premium Shop: check out some amazing deals and bundles with the Tachikawa Ki-94-I and Lockheed P-80A Shooting Star. The P-80A is, provided you are comfortable with machine gun armament, is a pretty good aircraft. It’s fast, it’s quite manoeuvrable and if you can keep your tail clear when shooting down opponents, quite competitive. On the other hand, the best that can be said for the Ki-94-I is that it’s highly situational. If you’re allowed to get behind bombers it’s lethal, but pretty much that’s it. A Me 265 will outturn it, so it’s not even that good at shooting down GAAs. It’s one for the collectors only, in my opinion. The machine guns are an advantage for inexperienced players. Edited by klbergmen, 31 January 2019 - 03:51 PM. The Ki-94-1 is like chip shop curry. You know you shouldn't buy it, but dam it, every time its on sale I am tempted. No idea why. Idk what you have against the P-80, it does over 400 damage in a second if all shots from the 6 guns hit, so with the average of 400hp on T8 aircrafts, it deletes most aircraft in 2 seconds(with my setup at least, get as much "accuracy on moving targets" as possible, its aim assist that leads your bullets straight to the target even if they are slightly off) and doesn't even overheat after that. Sure there are one hit wonders out there that can do it faster, but they have troll guns which overheat very fast and are useless in close combat, something like that is only good gainst bots heavies when they come head on to you for a ram or against noobs who fly like bot heavies. But ok everyone loves KV-2 because the one one-hit lets you forget the 3-6 misses/splashes before, i like reliability more than RNGuns. As for the Ki-94-1 it looks like a GA that lost some weight to gain some altitude, it should be able to delete some stuff and get away, at least from turn fighters but with that turn rate even a Me 262 looks like a turn fighter. It also has 2 weapon upgrade slots, so you could increase its firepower with 25% fire chance and the 5% weapon damage bonus from the long gun barel upgrade and use it like a "Firebreather" GA/Anti-GA/Anti-Bomber aircraft, you won't hit anything maneuverable with those 30mm guns anyway, they are most likely like every other 30mm+ gun in this game RNGuns. won the Ki94 a few months ago. It's a heap of crap, avoid. I won it probably the same way. I would not call it crap but I would also not spend money on it. In the bomber event it was useful, in normal random its probably not very useful. Edited by m249jim, 05 February 2019 - 05:57 AM. Special paintschemes are often good looking but worse that seasonal paints and so not worth anything. Edited by PocokSara, 07 February 2019 - 10:48 AM. Seems you have to fly one battle before you get it. if this doesn't help reopen the ticket until you get an answer. Please pay attention to the news articles with special offers. 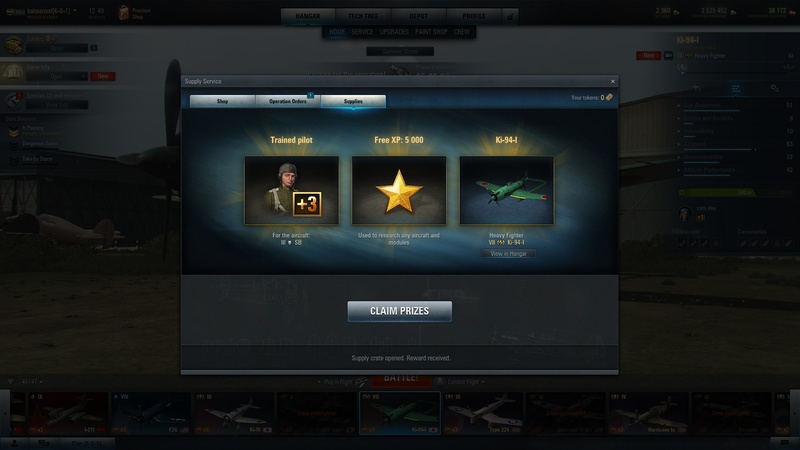 It is mentioned that you need to play a battle to get your camo, nose art and emblem. WTF, why are the Cannons of the Ki-94-I so loud? What you should be asking is why aren't the cannons and machine guns at least as loud on other planes?